Daft Punk is an electronic music duo consisting of French musicians Guy-Manuel de Homem-Christo (born 8 February 1974) and Thomas Bangalter (born 3 January 1975). Daft Punk reached significant popularity in the late 1990s house movement in France and met with continued success in the years following, combining elements of house with synthpop. The duo is credited with producing songs that are considered essential in the French house scene. It was managed from 1996 to 2008 by Pedro Winter (Busy P), the head of Ed Banger Records. Early in the group’s career, the band members were strongly influenced by groups such as The Beach Boys and The Rolling Stones. Bangalter and de Homem-Christo were originally in a band called Darlin’, which disbanded after a short period of time, leaving the two to experiment musically on their own. The duo became Daft Punk, releasing its critically acclaimed debut album Homework in 1997. The 2001 release of Discovery was even more successful, driven by the club singles “One More Time“, “Digital Love“, and “Harder, Better, Faster, Stronger“. In March 2005, the duo released the album Human After All to mixed reviews. However, the singles “Robot Rock” and “Technologic” achieved success in the United Kingdom. Daft Punk toured throughout 2006 and 2007 and released the live album Alive 2007, which won a Grammy Award for Best Electronic/Dance Album. The duo composed the score of the film Tron: Legacy and in 2010 released the soundtrack album of the film. In January 2013, Daft Punk left EMI Records for Sony Music Entertainment‘s subsidiary label Columbia to release its next album, Random Access Memories, on 21 May 2013. In the mid-to-late nineties, Daft Punk performed live without costumes in many places including the United States. In 1996, the duo were featured at an Even Furthur event in Wisconsin, their first public performance in the U.S. In addition to live original performances, they performed a number of times in various clubs using vinyl records from their collection. They were known for incorporating various styles of music into their DJ sets at that time. In the fall of 1997 they did their Daftendirektour to promote Homework in several cities throughout the world. For this tour Daft Punk opted to utilize their home studio equipment for the live stage. As Bangalter stated, “Everything was synched up—the drum machines, the bass lines. The sequencer was just sending out the tempos and controlling the beats and bars. On top of this structure we built all these layers of samples and various parts that we could bring in whenever we wanted to.” 25 May 1997 saw them perform at the Tribal Gathering festival at Luton Hoo, England, headlining with Orbital and Kraftwerk. Also of note is the 8 November performance in Birmingham, UK, from which came the recording of Alive 1997. At the start of 2006, Daft Punk announced plans for a number of special summer shows. On 29 April, Daft Punk performed at the Coachella Valley Music and Arts Festival where they received a jubilant reception for their first U.S. performance since 1997. Thomas Bangalter had initially been reported as saying that there would be a DVD of their recent live set. He later emphasized his reluctance for such a release, as the duo felt that online amateur videos of their performances were more compelling than anything captured professionally. In an interview with the Miami Herald Guy-Manuel de Homem-Christo stated that their 11 November appearance at the Bang Music Festival was their final for 2006 and that Daft Punk would conduct more performances in the future. The band later specified a date for a live show atBercy, Paris for June 2007. Also reported were dates at the Wireless Festival and RockNess in June, the Oxegen festival in July and Lollapalooza in August. Daft Punk then announced a world tour called Alive 2007. Daft Punk played at the RockNess Festival by the banks of Loch Ness, Scotland on 10 June 2007 as the headline act in the 10,000 capacity Clash tent. To the crowd’s displeasure, the show was delayed, but the crowd gave the duo a jubilant welcome when they appeared. Due to popularity, part of the tent was removed to allow thousands of people outside to see the show. On 16 June 2007 Daft Punk successfully headlined the third day of the O2 Wireless Festival to positive reaction and reviews. The Times described the set as a “memorable sensory spectacle, both dazzling and deafening” andThisisLondon declared it “an almost faultless set of relentless electro euphoria”. Daft Punk headlined Stage 2/NME Stage at the Oxegen music festival on 8 July 2007. 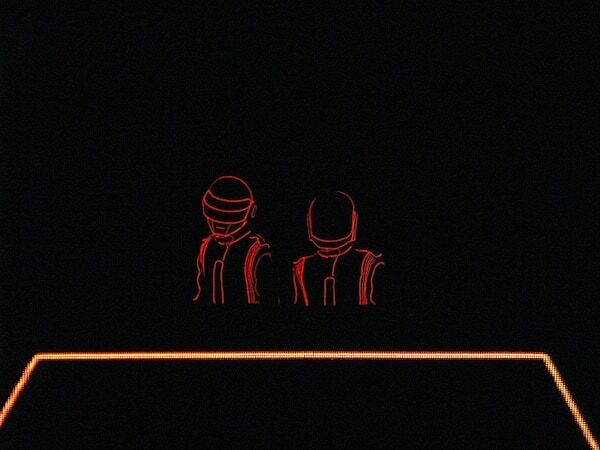 Their live set was preceded by a showing of the trailer for the film Daft Punk’s Electroma. Subsequent reports stated that the Daft Punk appearance was the highlight of the festival. NME wrote that the performance was “a robotic spectacular”, while Shoutmouth described the set as “typically triumphant”. Four days later, the duo played at Traffic Torino Free Festival in Parco della Pellerina in Turin, Italy. Daft Punk headlined the AT&T stage on 3 August 2007, the first night of the Lollapalooza music festival in Chicago. Their show there was praised by Pitchfork Media stating that the experience of watching the performance “was a much-needed reminder of the still-potent power of communicative pop.” On 5 August they performed at the International Centre in Toronto followed by an 9 August performance at KeySpan Park in Brooklyn, New York. Daft Punk mixed and composed much of the music for the Louis Vuitton Spring/Summer 2008 Womenswear Full Show on 7 October 2007. The duo also headlined the Vegoose festival in Las Vegas on 27 October. They appeared at the festival along with bands Rage Against the Machine, Muse and Queens of the Stone Age. At the end of the month, Daft Punk performed in Mexico City. The duo also performed on Friday 2 November 2007 at the Arena Monterrey in Monterrey, Mexico and Guadalajara. Modular announced that Daft Punk would appear in Australia for an event in December 2007 called Never Ever Land. The announcement addressed years of speculation on whether Daft Punk would visit Australia for live performances. Daft Punk were supported by their regular acts SebastiAn and Kavinsky at the appearances, which had been announced as an extension to the Alive 2007 tour. Never Ever Land toured to Melbourne at the Sidney Myer Music Bowl, Perth at the Esplanade, Brisbane at the Riverstage and finally Sydney at the Sydney Showground Main Arena. A Triple J interview with Pedro Winter (Busy P) revealed that Daft Punk’s Sydney appearance on 22 December would be their final show for 2007 and the last to feature the pyramid light scheme. Tickets for the Australian tour sold more quickly than for any Daft Punk-related event in their history. The duo stated in an EMI-sponsored live webchat that there will be no tour performances for 2008, and that they would instead focus on new projects. Daft Punk made a surprise appearance at the 50th Grammy Awards on 10 February 2008. The duo appeared with Kanye West to perform a reworked version of “Stronger” on stage at the Staples Center in Los Angeles. For the appearance, Daft Punk utilized four JazzMutant Lemur controllers. A press release specified that this was the first televised live performance by the duo in their career. Bangalter’s wife Élodie Bouchez also attended the event. In February 2009, a website stated that a “hidden” tour had been set for 2009. An event for 13 February 2009 in Shanghai, China was mentioned in the website. 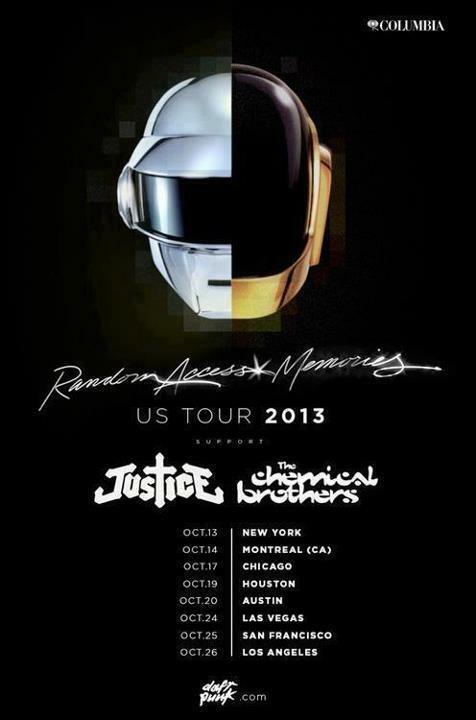 It was later revealed to be a hoax unaffiliated with Daft Punk and a scam to sell tickets for a nonexistent event. Representatives of the band announced that Daft Punk have no tour plans for 2009, but stated that the duo is looking forward to performing in China during their next world tour “in 2010 or 2011”. The announcement also stated that all of Daft Punk’s shows are and will be posted on their official MySpace page, and that the page can therefore be used to verify validity. In September 2010, The Daily Swarm reported that the duo would perform live sets in major cities to promote the film Tron: Legacy. Daft Punk made a surprise guest appearance during the encore of Phoenix‘s 20 October 2010 show at Madison Square Garden in New York City. They played a medley of “Harder, Better, Faster, Stronger” and “Around the World” before the song segued into Phoenix’s song “1901”. The duo also included elements of their tracks “Rock’n Roll”, “Human After All”, as well as one of Bangalter’s side projects, “Together”.